That's where the builders' experience comes into play, their understanding and underlying philosophy. I don't just sit there with a table of Colnago's or Italian bikes and copy them, that's incorrect. When it comes to bicycles and talking about the best way to fit a rider to machine, many an argument has sprung up over the minutiae of which way's best. Take a look at any 19th Century treatise on "The Wheel" and it's obvious the discussion has existed from the first day man threw his leg over the Dandy Horse. Here Darrell McCulloch shares his lifelong experience in custom frame building, dispelling some of the myths associated with the darkest of the cycle arts (drug cheats excluded). Darrell's bike fit concepts will aid in your quest for speed, power, comfort, handling and ultimately enjoyment. A Discussion with Darrell McCulloch of Llewellyn Custom Bicycles about the importance of position data meeting the needs of the rider, the data and rider's needs transformed into a practical work of art in steel. During the early eighties when Darrell was in his first years of discovering the art of manipulating steel, turning inanimate metals into objects of desire, he also raced bicycles. I first met Darrell mostly at races in New South Wales, he'd come down for races like the Musswellbrook to Tamworth or to race in the bitter cold of the Armidale Easter Tour. Years later I moved to Queensland and we've been talking about bikes ever since. Recently I rode over to Darrell's for a chat about bikes. He generously took the entire day out of his busy schedule to speak with me about custom frame building. While Darrell was running about the place getting ready the conversation started with …… "Do you want some slip on's for your feet? Just sugar that toast mate. How's that spin that Lance is squirming with at the moment? I'm sick of flies oh no whack (as a fly meets it's grisly end with a wad of newspaper) I'm actually working on a Voyageur a new Randonneur bike. This has a connectorless front dropout…" All the while, builders busily hammering and sawing away in the background, creating Darrell's new workshop for his live model steam locomotive passion. After the banter settled down, we got into the serious business of what it takes to pour your life's passion into creating bespoke bicycles. I sat there quietly listening to Darrell deliver in one day, a summary of his vast life experience, in translating his customers' dreams into practical and useful bicycles. Bicycles where once position data meets the needs of the client, they become an expression of Darrell's enthusiasm for perfection. Paint a whole bunch of bikes "East German Grey" say a Colnago, De Rosa, Llewellyn, or some "El Tubo Thing" and people didn't know the difference, then swap them from bike to bike regularly, rode each of them for two weeks at a time. You'd then get a real evaluation because all the brand lust is removed. What comes out of the factories on any one day, they're built by a bunch of blokes who just go to work each day, not a bunch of "Italian Craftsman". Joe Cosgrove went to Italy with KT (Kevin Thompson), there was some bloke there wanting his job back, I think to Joe that exploded the myth about Italian bike building, it's commerce. They talk about craftsmanship, no, it's labour, hand labour. For builders of today who want to be independent bespoke builders, the biggest problem they will encounter is understanding their message. I learnt that from Richard Sachs in the last twenty years how important understanding your message and marketing is. Richard is an independent builder in the States building one style of frame with lug variations, he has quite a queue of work and spends a lot of time marketing himself. For me I'm into the technical aspects of frame building, I spend a lot of time on the position data and biomechanics, I've built shoe jigs for Dr Brian MacLean, I like doing design work and using CAD and I like creating a variety of frames. I'll use different tube diameters for larger and smaller riders. I wanted to build in lugs that didn't exist. In order to use different tube diameters, sloping top tube lugs and larger diameter XL lugs, I sat down and learned how to use 3D CAD. 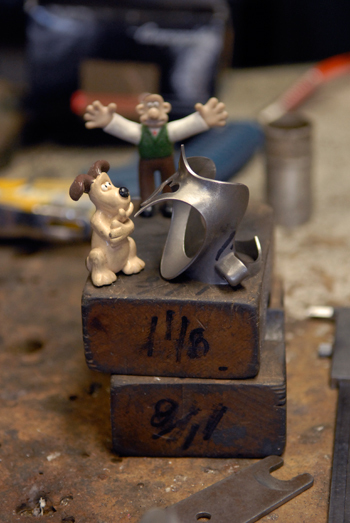 Then began liaising with tool makers and casting house people and came to an arrangement where my own lugs were manufactured using my design, now I market and sell them to other frame builders all over the world. The XL lug set I designed in 2004 became a replacement for MAX tubing because it was drying up at the time. Max was good not because of it's funky shapes, it was good because of it's larger diameters and a heavier tubeset than had ever been produced before. MAX was good for people who wanted a stiff frame or required a stiff frame because they were big and heavy. The Max lugs were problematic, they must have been designed by some Italian fellow at three O'clock on a Friday afternoon after he'd had a couple of beers, really they're like agricultural machinery. They weigh a ton and are crudely designed. You'd spend too much time reworking the MAX lugs to be acceptable to my expectations. So I worked with Dedacai and got hold of some larger diameter tubes, had custom seat posts made and added in my own bespoke lugs. You can ride in a position in many different ways. The position has a bearing on the bio-mechanics. When you're building a custom frame, it's position data first, then the frame is made to meet that data. When you start at the bottom you start with the type of saddle, that's very important. Then we know what brand and make of seat post we're using because the dimensions of that will influence the seat tube angle. The seat tube angle only needs to meet the requirement of holding the saddle where it should be, at the mid point of the saddle rail. The seat tube angle has no bearing on the handling of the bike or the performance of the bike. The position has that effect, of influencing the handling, not the seat tube angle. It doesn't matter whether the seat tube angle is 72 degrees, 72.5, 73, whatever, it just needs to go to where you need it to go to place the saddle mid rail! For example you might have really long femurs, and may require a 71.5 seat tube angle to meet the correct requirement. Back in the day riders used to just smash their seat all the way back on the rails, the seat tube angle obviously didn't meet the correct requirement? That's because the seat tube angle in this instance was not slack enough. Maybe the limitation here was the frame, so the seat just got smashed back as far as it could go. Yet working to a more slack seat tube angle would have achieved the correct saddle position, mid rail. Well this comes into Claude Gensling, who worked in the late seventies with Renault Gitane and Bernard Hinault. There was a book they wrote called Road Racing Techniques and Training. This was the start of proper biomechanics and we went from there forward. Once we've got the position data for the seat tube, next is the handlebars. So we want to know what the shape of the handlebars will be and where we are placing them in the X and Y axis - X is horizontal and Y is vertical, in relationship to the centre of the bottom bracket shell. A nice bar to use is the Deda Zero 100, they're a good shape, no funky bumps, they're alloy so they won't break, they're light but won't crack if you fall off. Once we know the seat position and bar position, we want to know what style of bike we're talking about, is it a racing bike, a randonneur, touring bike or track bike. Next we want to know the placement of the wheels. Going back from the stem, the head tube angle, fork rake, to get the front end geometry. Then you just draw a line across, so the top tube it just intersects that. That's where the builders experience comes into play, their understanding and underlying philosophy. I don't just sit there with a table of Colnago's or Italian bikes and copy them, that's incorrect. Depending on your seat tube angle it will either lengthen or shorten your top tube. So you've got a fixed position for the front end in relation to the cranks / bottom bracket. The seat position is achieved by manipulation of the seat tube angle, it will sit mid rail on the post, that way it won't be bending the post and stressing the seat rails. The placement of the back wheel is very important. Take a look at the "production builders" they have the same length back end of the bike, generally very close to the seat tube no matter whether you are five feet tall or six foot six, well that's wrong. You hear all that talk about shorter chain stays improve power transmission, what a load of nonsense. Frames don't eat wattage up, stiffer frames are not faster, if they were we'd be riding lumps of granite. Frame rigidity should be matched to the rider, (also see Hooke's Law) whether it's their weight and a little bit of personal preference, with the aim to give good handling. A good handling bike inspires confidence in the rider, they feel at ease. where is a constant factor characteristic of the spring, its stiffness. What about front end geometry? I started when I was sixteen reading C.O.N.I (The C.O.N.I. 1972 Cycling Manual - publisher | F.I.A.C. and the Italian Central Sports School - Rome, 1972.) and Genzling all that sort of stuff. What I learned from other builders, working with national teams is that team riders just use what they get paid to ride. They don't go for the trendiest bike, the riders just become a marketing arm for a bike company. Here I work to position first then geometry. I can make you the bike, give you your position, do a CAD drawing, not just the frame but the position as well. Here's an example of a frame I'm working on, you can see the position data is critical, it's position first then geometry. I get two types of clients, some have been around for many years, they know what they want, they're happy for me to measure their position data . Just doing body measurement is the worst way to go because it doesn't take into account your posture, you'll sit differently on the bike at age fifty to what you would aged eighteen. Some of my clients have their position sorted and I work to that. If they are not sure, I recommend Dr Brian MacLean. Brian can apply his experience to us ordinary punters, he'll pick up on bio mechanical issues that others won't see. It takes a lot more time to get a good bio mechanical assessment, say there's a twist in the spine, or knees knocking for whatever reason, well it doesn't matter what the fit of the bike is, that's a body problem. A bike fit can't "cure" a bio mechanical problem, but a bio mechanical assessment can identify if there's something going on, perhaps from an injury that wasn't treated. A racing cyclist's spine can twist during one season, they may become dominant on one side, be injured, they still ride through a tour, or after a bad crash and one side will be all tightened up. So that will be switching one side off because it's "protecting itself" so you'll end up with a twist and you've got to go and see a physio and get it sorted out. Some riders expect the bike fit to "cure" their problem, whether it be a pedal system, whatever they dream up. Some prefer to spend money on gear rather than identifying and fixing their particular bio mechanical problem. Many times it is a matter of one hour a week on the masseur’s table getting a hammering rather than fancy equipment. In the end, the bike has to be good, but it's about the engine, the bike is just the tool. A good fitup and a good bespoke builder, is building the tool for you to use. So you have to have skilled people. With fitup, Brian's the best way, but remember that can even alter, say as a person loses weight and gets fitter, things change, they'll sit differently on the bike six months later. The skill of the builder is their interpretation of your position, then designing the bike to meet your needs. A big thanks to Dazza for sharing his tips and tricks, and all the cups of tea and toast, not to mention the fly free premises at Llewellyn Custom Bicycles - soon to be the dual - model steam locomotive workshop. Do you reckon we'll be able to twist his arm to build bicycles once the locomotive workshop starts up? How Darrell McCulloch learnt to build bespoke bicycles, now collected and ridden by bike style mavens. Darrell McCulloch from Llewellyn Custom Bicycles talks about bike fit and the practical application of position data. Llewellyn custom bicycles, Voyageur randonneur bike project. Llewellyn bike, custom Slant Six by Darrell McCulloch bespoke frame builder Brisbane Australia. John Caskey's Llewellyn bike, custom made by Darrell McCulloch to be rock solid and last for decades to come.